Hotel, restaurant, canteen, nightclub and deli owners, it’s high time you get the right ice machine for your facilities. There are several models on the market, but you can only choose the one. To help you pick, we’ll introduce you four of the best commercial ice machines. But before we get to the point, bear in mind that you have to purchase a unit based on three major criteria: the production capacity, the embedded technology and the ice pieces shape. Are they going to be bullet, round, cube, sonic or nugget shaped? Or are they going to be crushed? There are also other criteria you should consider. For instance, the designed area where you’ll place it. To be certain you’ll buy the right ice maker, you need to make a need-oriented choice. The hOmeLabs Commercial Ice Maker is a highly efficient one. It can make 45 pieces of ice within 11 – 20 minutes and can store up to 29 lbs thanks to its over-sized cabinet. That is quite enough for a small business or for a big household. If you need more to keep serving fresh drinks, the ice machine can produce 99 lbs of ice in 24 hours. The device allows you to choose your ice size with the (+) or (-) buttons. This 17.6 x 15.7 x 31.4-inch ice machine is small enough to be placed anywhere, even on ground thanks to its freestanding design. However, it needs to be connected to a water supply. The hOmeLabs Commercial Ice Maker is also equipped with an automatic cleaning function. The Best Choice Product commercial ice machine stands out because it’s portable. However, it is still quit a heavy device since it weighs 62.3 lbs despite measuring 17.5 x 15.5 x 31.25 inches. Like the hOmeLabs Commercial Ice Maker, it makes 99 lbs of ice per 24 hours with a cycle time of 11 – 20 minutes. Its storage capacity is nonetheless bigger – 33 lbs. It is therefore ideal for a restaurant or another bigger business. Also, it allows you to choose the ice cube sizes. The Best Choice Product commercial ice machine has also been smart designed. It has buttons that allows you to set an auto-timer and the self-cleaning function on. Highly efficient, the VEVOR 110V Commercial Ice Maker is one that you keep in your heart and on your counters. Within 12 – 18 minutes, it can make 40 pieces of ice cubes and 88 lbs to 110 lbs of it in 24 hours. 44 lbs of it can be stored in its cabinet. However, it only offers a unique size of pellets but they’re perfect for drinks and water bottles openings. In spite of that tiny flaw, the VEVOR 110V Commercial Ice Maker is still a favourite because of its intelligent features. 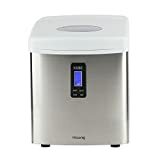 It has an operation panel full of buttons and light warnings: auto-cleaning, ice making, shortage of water, high temperature, full ice bucket, … And on top of that, it has a nano antibacterial liner. No bacterial growth, clean ice and fresh drinks. What more to ask for? The ROVSUN Built-in Stainless-Steel Commercial Ice Maker is a fast and efficient ice machine. It makes to 100 lbs of ice per day and procudes a batch of 0.9 x 0.9 x 0.9-inch-thick cubes within 12 – 18 minutes. It is a perfect undercounter device but can also be place anywhere else in your store, café, supermarket or home thanks its freestanding feature. It’s equipped with smart features but what you’d love about it is that it’s energy saving and quiet.